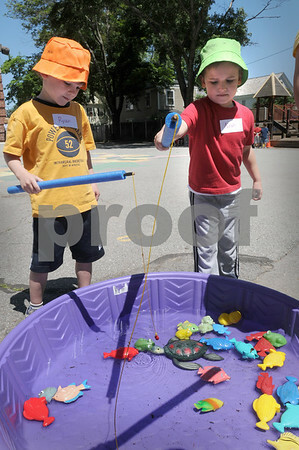 Newburyport: Ryan Brennan, 6, left, and Noah Foley, 7, try their hand at fishing in the Fish Pond Station. The two were at Newburyport's Brown School Fun and Wellness Field Day. Bryan Eaton/Staff Photo Newburyport News Tuesday June 16, 2009.